Have you ever thought about the energetic and therapeutic properties of salt? Yes, that’s right. Halite is nothing more than the salt stone and because we are in contact with this mineral every day, we tend to think it does not have much relevance. In this article, we are going to talk about this wonderful way of energizing. Halite (also known as rock salt) is the mineralogical name for what we know as sodium chloride or simply salt. The salt is basically constituted by two elements: sodium and chlorine. Sodium is a rather unstable element, silver colored and reacts violently if there is water around. Chlorine is a dangerous, potentially lethal gas, but when combined with sodium chloride, it forms the white compound that is essential to human life. When salt appears with its natural and raw characteristics in nature, we call it halite. Think of salt stones, fossil salt, and everything that refers to the hardness of halite, compared to the salt we know. From ancient times, salt was used by Romans, Greeks, Asians and Arabs in various situations, both in business and in religious rituals. Halite is a stone symbol to break bad energies and evil’s eye. Virtually in all cultures, this stone is seen as a powerful talisman against black magic, witchcraft, and other evils. And beyond protection, it is also able to attract love, luck, and sympathy from the people who live around you. 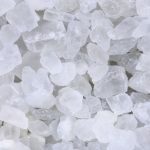 Salt is in the mystical repertoire of many people from a very early age, so when we talk about halite, we must think of the salt properties we know of. Halite is mainly recommended for cleansing the aura, that is, the field of light that surrounds every human being. When our aura is unbalanced, the quickest way to recompose it to its natural state is through the use of salt in baths. On the therapeutic side, we can think of halite as a wound healing. If you dissolve it in warm water you can make gargles that help cure all throat problems, such as tonsillitis and laryngitis, for example. Benefits go beyond the throat. You can soften a sharp toothache and even facilitate the removal of boils using the same solution of warm water and halite. We have already talked a little about how to use this stone in its therapeutic functions. Now we will focus on its mystical use. The best way to take advantage of halite’s properties is to take a bath with it. You should always take the salt bath after your regular bath, whenever you feel the need. And you should never throw the water over your head, it is always from the neck down. Dissolve the halite stone in warm water in a bowl. After your regular bath, hold the bowl with both hands and pour over your body, mentalizing only good things. It is not necessary for you to rub the crystals of salt in the body, since the intention of this bath reaches only the energy field and not the physical one. Dry gently afterwards. We also know that this is a very sensitive stone and its use in jewelry is quite limited compared to other stones. It also has its structure affected if the environment in which it is is very humid. Note that it is not that the use of halite in these forms is unimpressive. You could use them like that at your home, but we always recommend bathing in the first place.